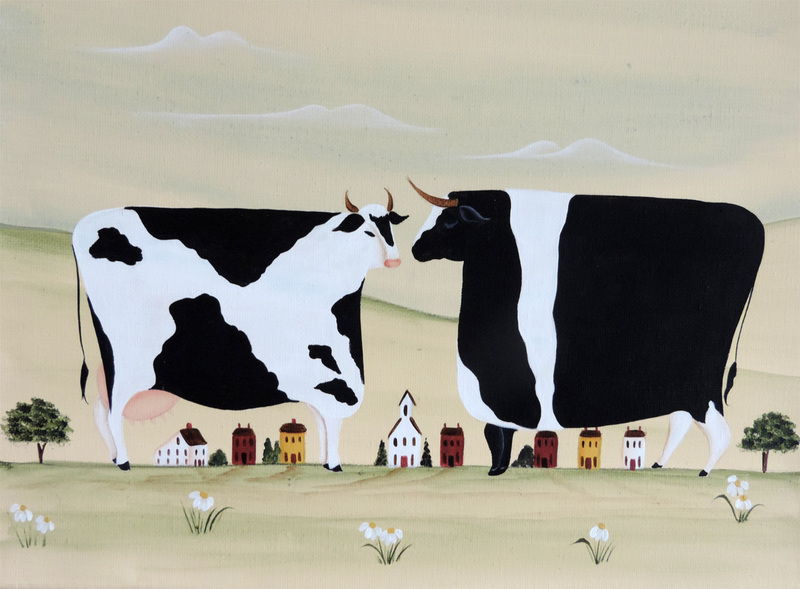 Press play, for more about my Folk Art paintings. Inspired by the collection of antique weathervanes at the Folk Art Museum in Williamsburg, Virginia. On many of the old farms the weathervane was an indication of the type of farming which took place there. A wonderful outdoor, organic, culinary festival which was held locally for years. 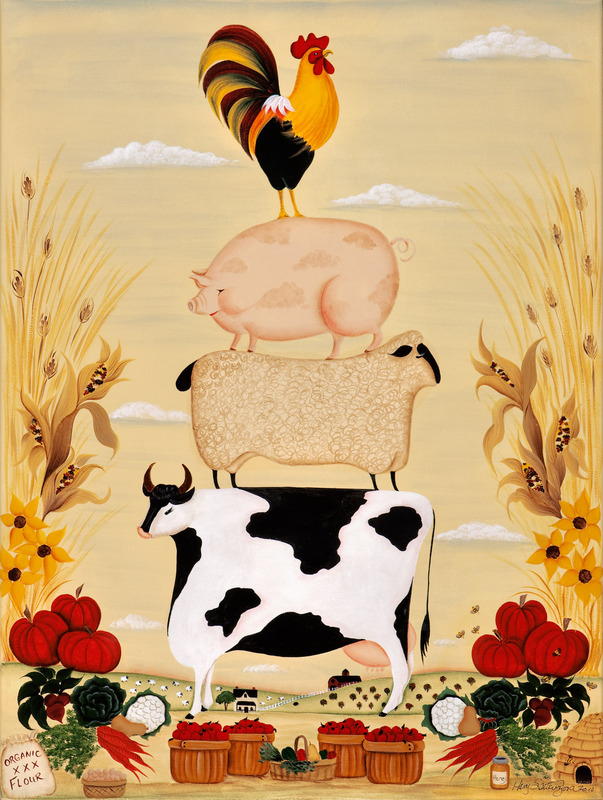 Painted as a fund raiser for The Children’s Organic Garden at Cold Creek Conservation, the Folk Art Pyramid is shown surrounded by local produce. 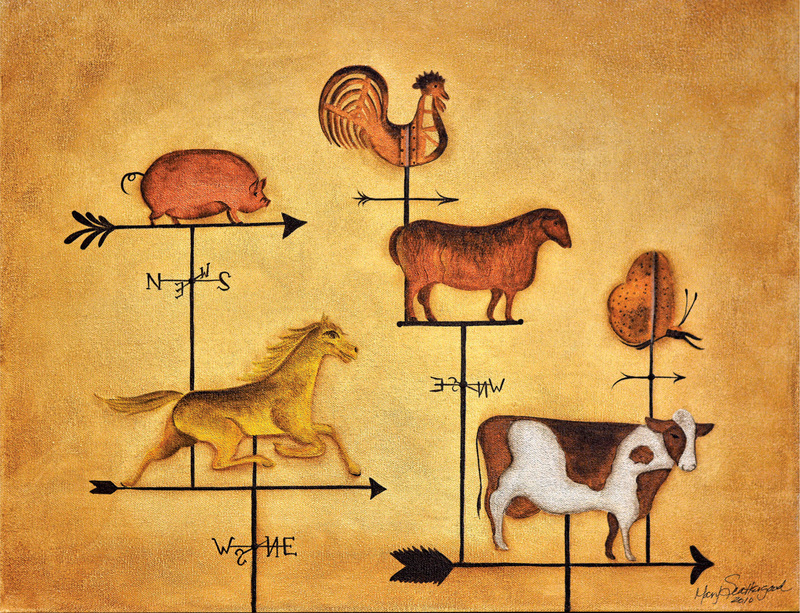 This lovely arrangement of animals has been around for several hundred years in many forms. I have painted it myself numerous times. To me this represents a true example of American Folk Art. 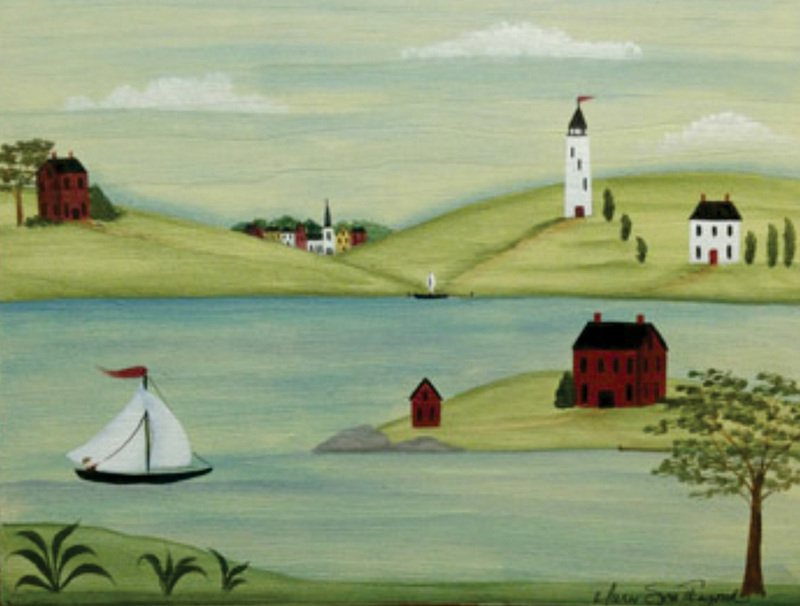 I am a huge fan of the work of 18th century artist Rufus Porter and have created many paintings in this style after a wonderful boat trip down the St. Lawrence River one summer. 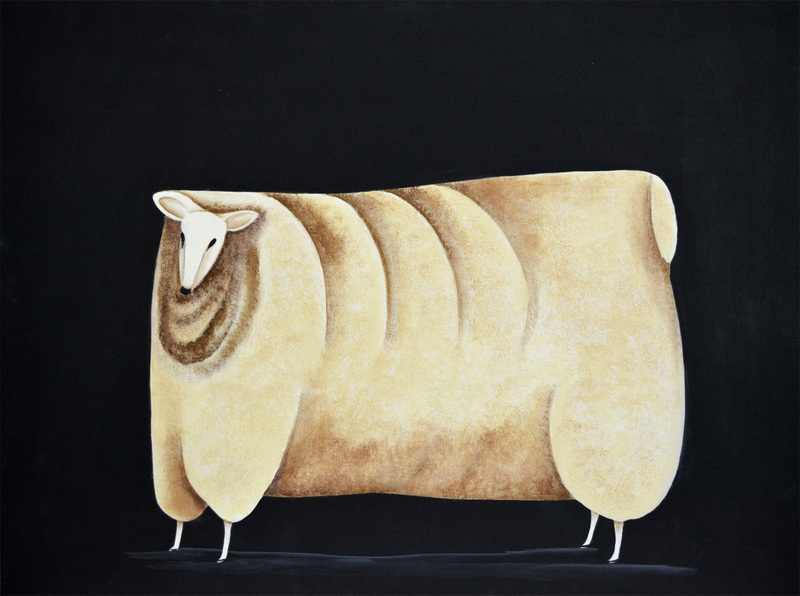 I have always had a fondness for sheep since my weaving days. They kindly provide comfort and warmth. This sheep is ready to meet the shears. 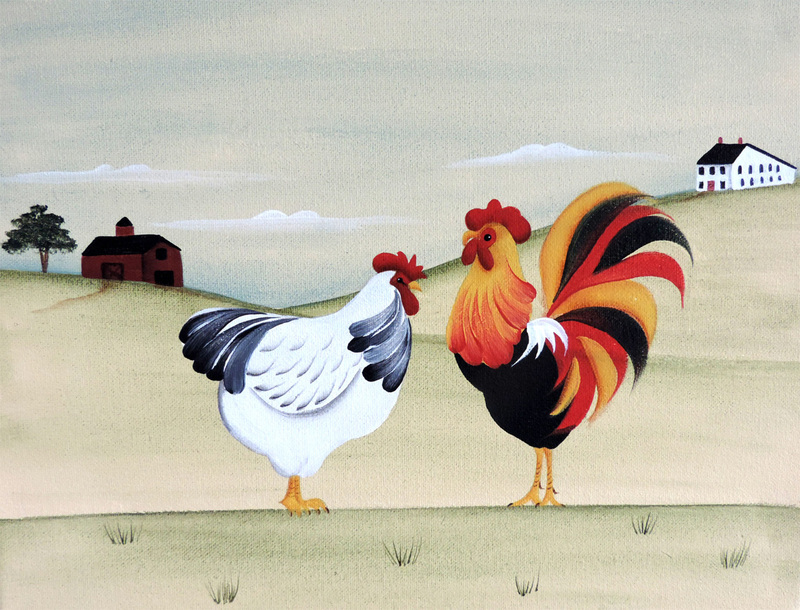 The farm is my favourite theme and what farm is complete without a hen house. I love this pair. They seem to be courting. As a small child I had a close encounter with the swans of Wells Cathedral in England. Because of that experience I have always had a fascination and a healthy respect for these beautiful creatures. This lovely house in Kleinburg was our home for 17 years. We grew together as a family, added a son in law and three beautiful grandchildren, and shared its welcoming grace with many friends and family. This is a traditional early American style often found in mourning pictures and young girls’ needlework for the 1700s and 1800s. I like to think of it as the tree of life. I often use it for baby gifts but the partridge and pears make it perfect for the season. When itinerant artists of the 18th century painted prize winning livestock, they portrayed them larger than life to fan the farmer’s ego and ensure the sale of the painting. 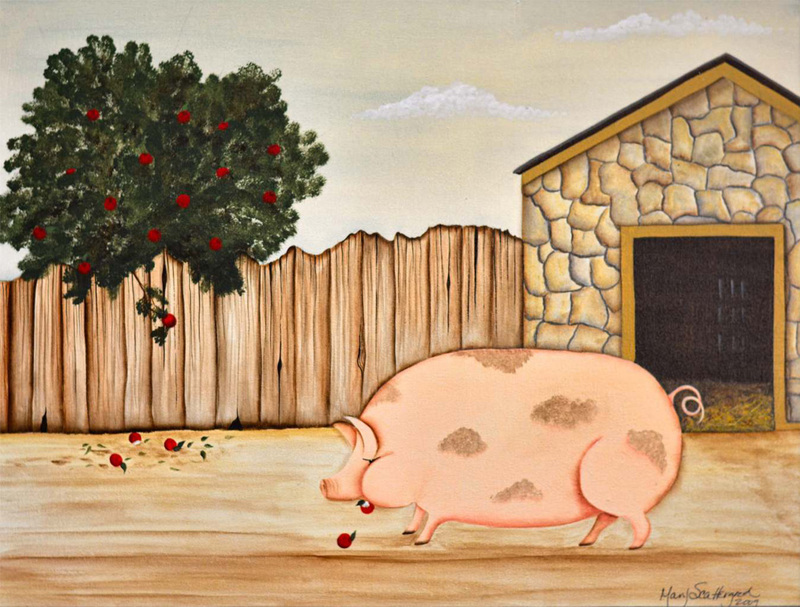 Painted for my grandson, Duncan, after a visit to Puck’s Farm in King Township. Neither of us could believe the size of that pig and we went back several times to visit her. A most amazing man. He lived from 1792 until 1884 in New England. He was an inventor, artist, author and the founder of the magazine Scientific American, which is still published today. 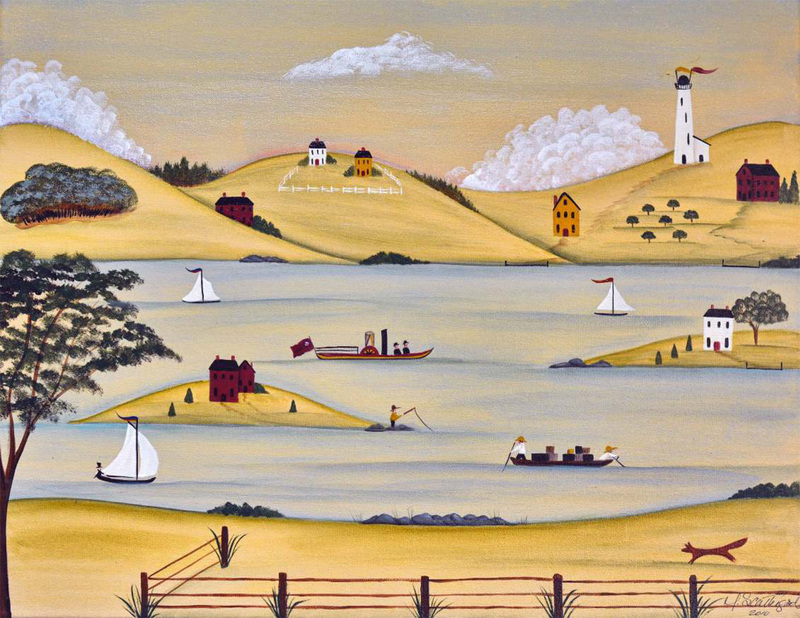 I discovered one of his murals in New Hampshire many years ago and I have been fascinated by him ever since. 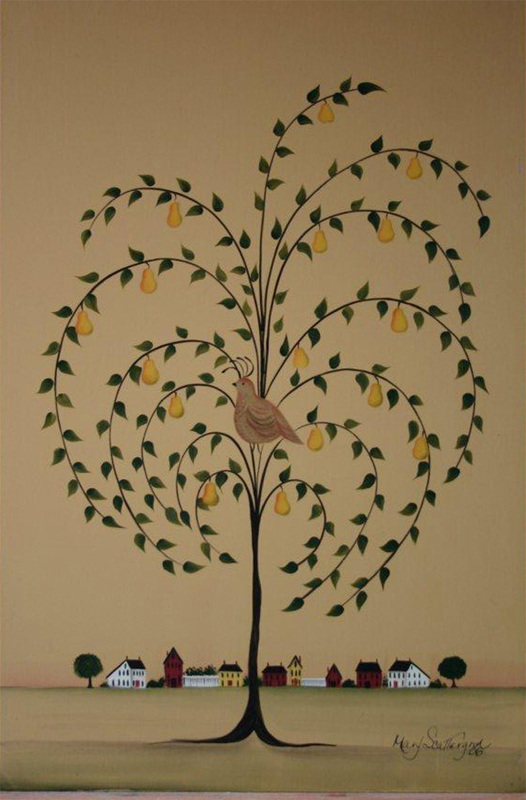 I took a wall mural class at the Rufus Porter Museum in Bridgton, Maine and this painting is a result of that class. His simple style definitely influences my work. 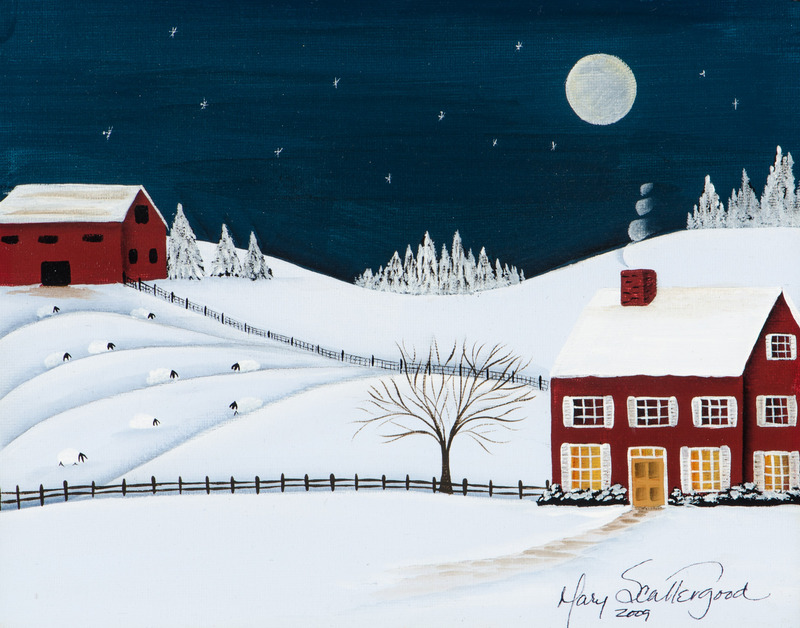 A few years ago I painted a series of farms in winter. One of the things I love about them is their tranquility. 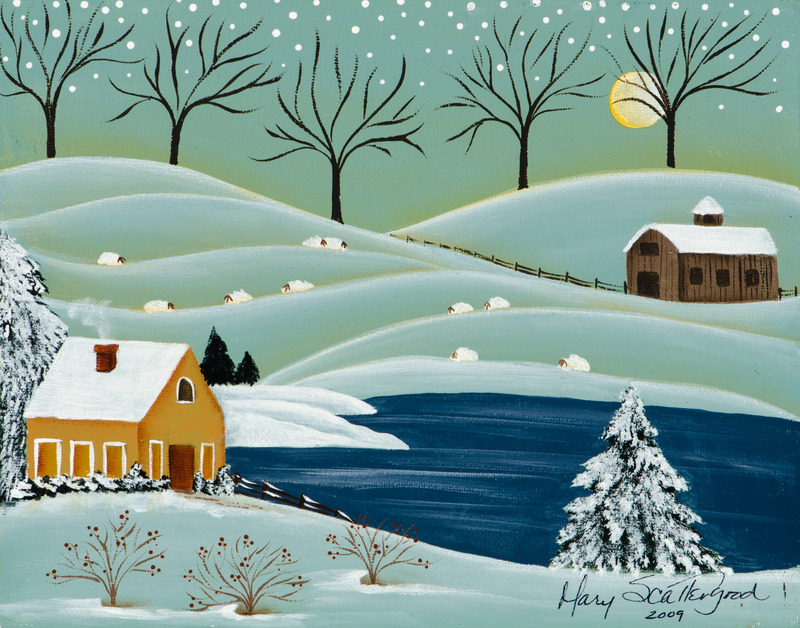 The great stretches of snow covered fields and the quiet barns and houses make me think of hibernation. Farms seem to sleep in winter. Dairy farmers would not agree. 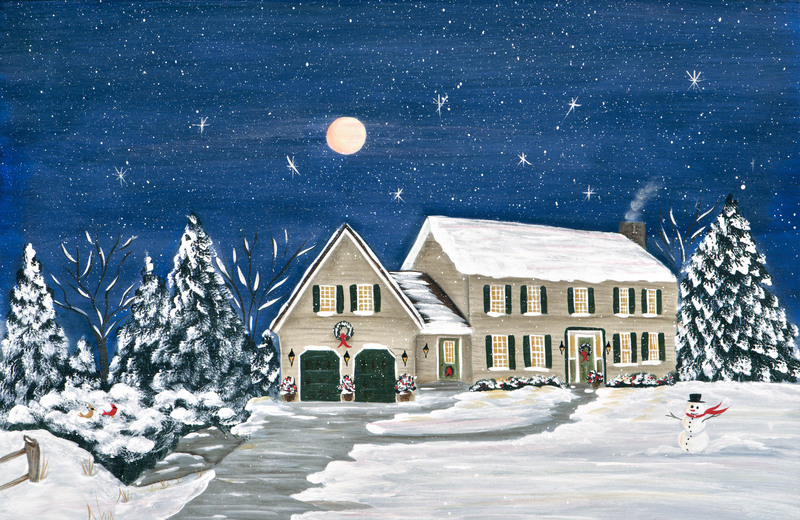 Nothing creates a sense of peace and joy like a quiet, starlit December night in rural Ontario. 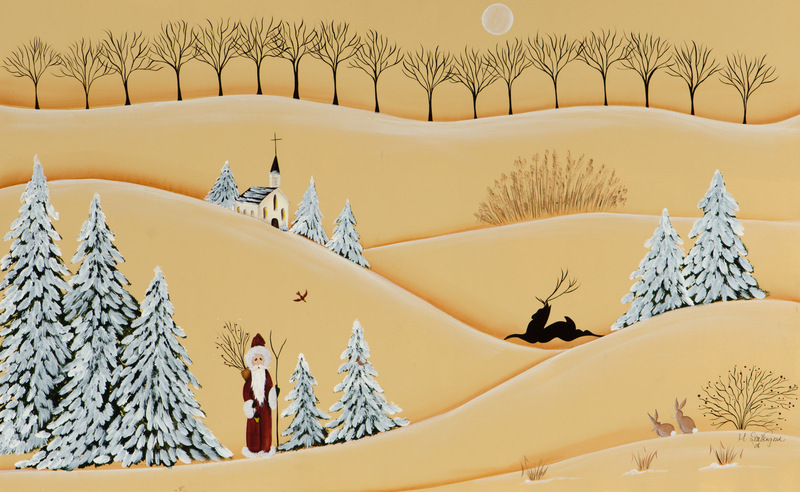 This little folk art Santa is my favourite. He is from a time before the frills of the Dickens’ Victorian Christmas and I love the simplicity. I painted the landscape with simple folk art icons such as the leaping stag and the little church to complement his style.